Times were tough for American businesses during World War II. Rationing by the U.S. government made conducting business a lot harder, but Americans largely understood that it was a necessary sacrifice if they hoped to win the war. But with tight restrictions on certain foods, restaurants like White Castle had to get creative when designing their menu. Sometimes that creativity meant buying black market beef, as White Castle's New York locations did from the "Lombardi Brothers" in 1943. Other times that meant coming up with new items. Everything from spaghetti (which turned out to be quite popular in places like Minnesota and Cincinnati) to chop suey (which as far as I can tell was never actually introduced anywhere) were considered. In his fascinating 1999 book, Selling 'em by the Sack: White Castle and the Creation of American Food, author David Gerard Hogan writes about the different items the restaurant contemplated adding, many of which made their way to various White Castle locations across the country. Hogan describes a company memo which suggested alternatives to the hamburger, including: chop suey, grilled cheese sandwiches, baked beans, eggs, spaghetti, chili, hot dogs and fish patties. The company even considered meatless burger options. In addition to substituting alternative foods for their hamburgers, White Castle also seriously considered serving "meatless" hamburger sandwiches. Benny Benfer started exploring these alternatives even before rationing began and discovered a wide array of choices. He found that many major food producers were already marketing meatless sandwich patties, with John Harvey Kellogg's Battle Creek Foods offering the largest selection. Battle Creek offered two nonmeat patties, one made from yeast and vegetable juices and the other from wheat, peanuts, and salt. Columbus neighbor Special Foods also offered a meat alternative named "Numete." It consisted of peanuts, corn flour, salt, and seasonings and was said to taste like beef. The most abundant option was the soy burger offered by numerous companies. Loma Linda Foods offered "Vegelona"—a mixture of soy beans, tomatoes, onions, and peanuts—and "Proteena"—a concoction of soy, tomato juice, and yeast extract. After a thorough investigation, the product toward which Benfer leaned was not a meat replacement but a meat extender called Soya Flour. Made by the Central Soya Company, Soya Flour was high in both fat and protein and was very inexpensive. Benfer actually bought three, twenty-five pound bags with which to experiment, but no record exists that White Castle ever mixed its meat with soy flour or anything else. With egg sandwiches to fall back on, White Castle never had to resort to a vegetarian menu. Perhaps the most revolutionary food change to come out of WWII rationing was an item that's hard to imagine any American fast food restaurant without: french fries. Potatoes were abundant and inexpensive, so fries were a relatively easy addition to the White Castle menu once workers figured out how to safely prepare them in the fryer. 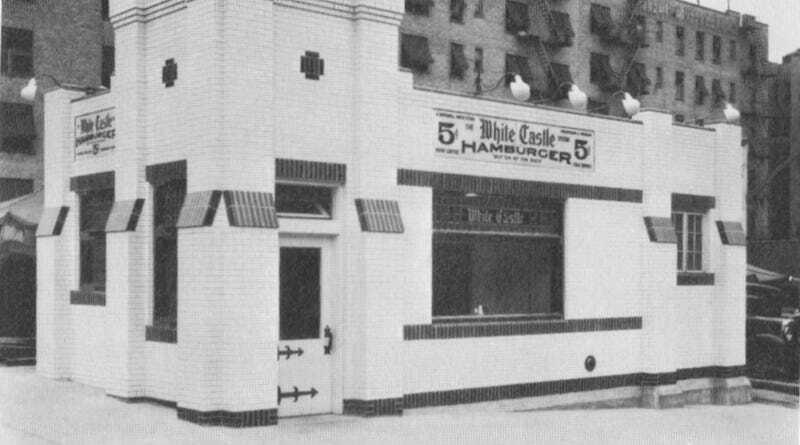 Fries were a popular snack served on their own in the U.S. before World War II, but it wasn't until White Castle included them with their meals in the 1940s that they became inextricably linked with the hamburger. "Before long," Hogan writes, "White Castle patrons grew accustomed to eating an order of french fries with their hamburgers or egg sandwiches, and the demand for them kept increasing, even when the shortages disappeared after the war." Gives a whole new meaning to that "freedom fries" meme, I suppose.